If you’re anything like me, then you may have a love-hate relationship with summer too. While the heat and humidity are unpleasant, to say the least, I do enjoy the longer days. Those extra hours of daylight allow me to get more done. Which really comes in handy when I want to tackle seasonal cleaning. Although, even with the extra daylight hours summer brings its share of challenges to keep our homes tidy. Dripping popsicles and wet swimsuits to name a few, require quick cleanups and a plan! 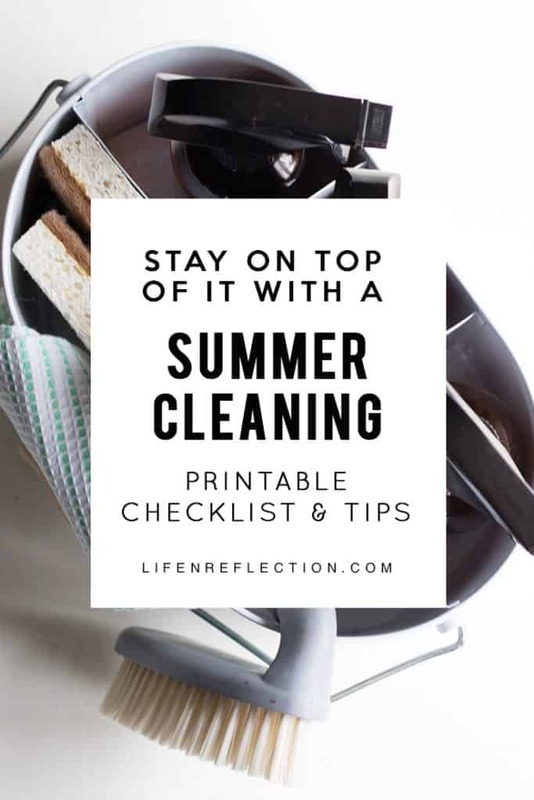 Let me help you stay on top of it with a printable summer cleaning checklist and tips to tidy up. During the summer we find ourselves going from indoors to out a lot more often. Extra foot traffic and especially going back forth from the pool equates to dirty floors! This means you’ll have to clean the floors more often too. If you have a lot of carpeted areas, I’ve got the best solution ever to refresh and revive carpets and rugs! 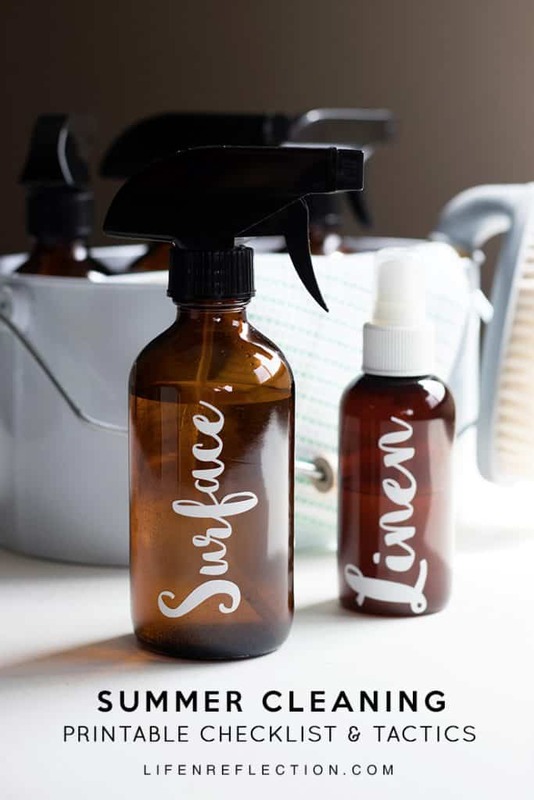 What smells amazing, cleans without toxic chemicals, and lifts odors instead of masking them? 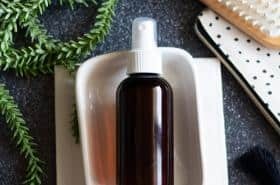 Essential oils and baking soda my friends. Yep, that’s all you need. But first, go the extra mile and use a window squeegee to scrape the top of carpet and rugs to remove hidden pet hair, fuzz, and the unknown. 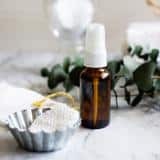 Then sprinkle on the this DIY Lemon Myrtle Carpet Refresher, my secret to spring fresh home all year round. And if you uncover some hidden surprises, a.k.a. 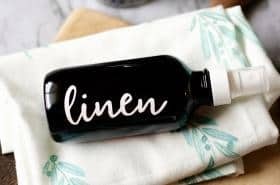 ugly carpet stains, mix together a bottle of this easy homemade natural DIY carpet stain remover to spot clean. You may also want to consider placing doormats at every outdoor entrance and asking guests and family members to remove their shoes when they come inside. The summer is really is the best time of year to clean the windows. The warm temperature and sunny skies allow them to dry quickly and if you get wet washing them, you won’t be cold. To save time, try vacuuming the screens. Remove the screens and wash them in the sink or outdoors with the water hose and liquid castile soap. After the screens are cleaned (even if they are still drying) get to work on the outside of the windows. Start with a long handle broom or leaf blower to remove dust and cobwebs. Beware of possible hornet, wasp, or bee nests. Next, using a water hose with a sprayer or power washer set to work washing out the windows. When it comes to the inside of the windows use my recipe for a natural Streak-Free Glass Cleaner. It creates a professional foam spray without chemicals. And it’s incredible for cleaning photo frames, mirrors, windows, and glass cupboard doors too. No doubt one of the best things about summer is the food. Ice cream, lemonade shake-ups, barbecue sandwiches, and popsicles, unfortunately, can make quite a mess. And with insects in full swing during the summer months, you’ll want to clean it up fast! I recommend keeping your microfiber cleaning cloths nearby along with the simplicity of using just ONE cleaner for almost everything. 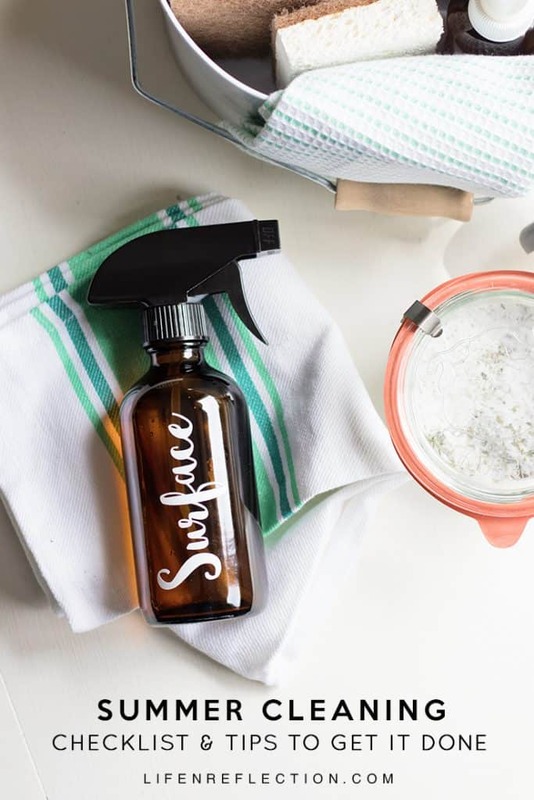 This homemade All-Purpose Natural Surface Cleaner can be applied to just about anything! 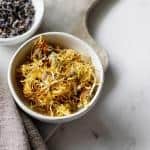 To keep the spills away enjoy your favorite summer foods outdoors as much as you can. We certainly go through a lot of clothes in our house during the summer months. Play clothes, yard work clothes, swimsuits, towels, and sundresses mean our laundry room is working overtime! Dry your clothes outside when you can and use wool dryer balls to cut drying time in the dryer. 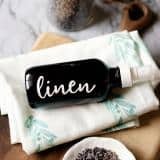 Check out my tips for ditching dryer sheets here and save money with Homemade Liquid Laundry Soap. 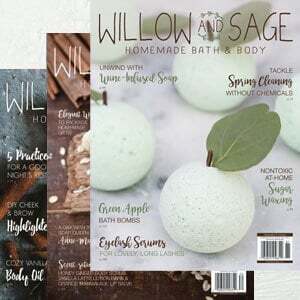 It’s an all natural laundry soap recipe made with only 5 ingredients and HE washing machine approved. The bathroom needs a little extra TLC in the summer due to the heat and humidity. Help keep mold and bacteria away by running an exhaust fan while showering and using a Natural Daily Shower Spray in your daily cleaning routine. Just a few quick sprays every day after showering helps keep mold, mildew, and soap scum away! 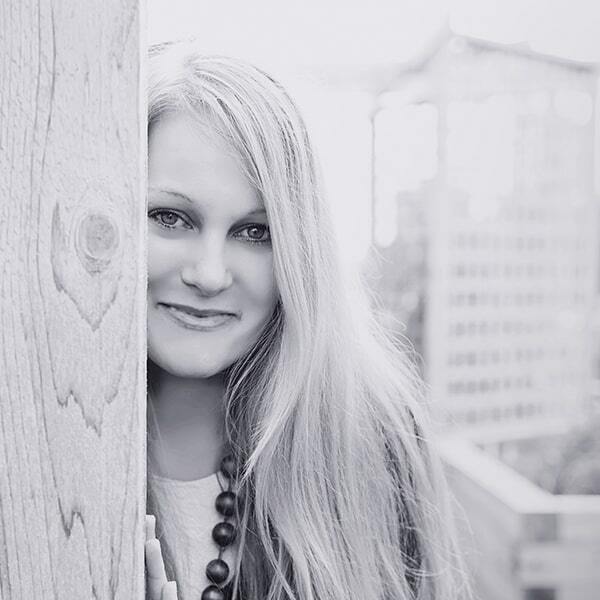 Find more clever tactics to clean your bathroom sans chemicals in my book No Nonsense Natural Bathroom Cleaning Methods, That Work. Mattresses need to be cleaned twice a year; summer and winter to keep dust mites under control. 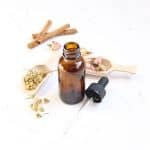 Start by sprinkling Odor Eliminating Refresh Powder on the mattress,. Let it stand for five to ten minutes. Then vacuum the top the mattress. Remove the mattress and vacuum the top of the box springs. Now, flip the mattress and place it on top of the box springs. Sprinkle with refresh powder again, following the instructions above. Do this for all the mattress in your home. Keep things fresh on a weekly basis by washing sheets in hot water and applying a natural linen spray. 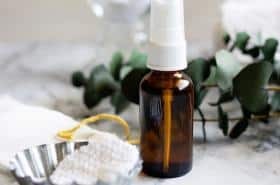 Homemade Fresh Lemon Vanilla DIY Linen Spray is my current favorite. 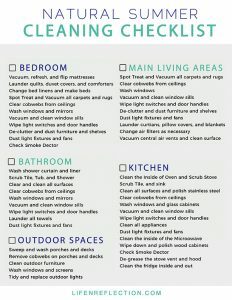 Print this handy Summer Cleaning Checklist to keep track of your progress. Grab it and more printables, checklists, and reference guides in the Life-n-Reflection Resource Library. 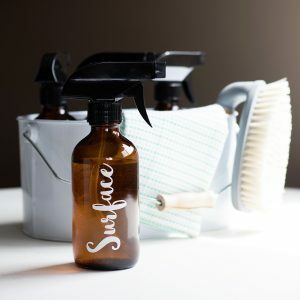 Summer can certainly bring its share of cleaning challenges when things heat up. Stay on top of it and make the best of the extra daylight hours with this handy summer cleaning checklist. 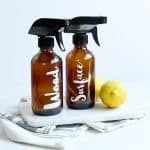 Not ready to make DIY cleaners? 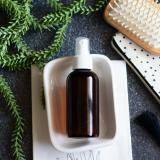 Then grab a free Mrs. Meyer’s 5 piece cleaning set from the Grove Collaborative!